"Eclectic" is word I tend to use a lot in these album reviews, especially being that there are not that many synonyms. And the word gets thrown around a lot since eclecticism is the philosophy behind this radio program, and thus one of the criteria for picking an album to feature. It's a quality that can take varying forms, such as mixing genres or musical cultures, or experimenting with non-standard instrumentation or approaches to singing. As you might expect, this week's album also represents that quality of being an amalgamation of styles, or catholic, syncretic, heterogeneous, or whatever other synonym you care to find. 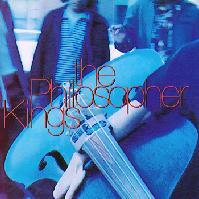 It's the eponymous debut by a young Canadian sextet from Toronto called The Philosopher Kings. And what the Philosopher Kings do is create a intriguingly uncategorizable admixture of 1990s dance, funk and so-called "acid jazz" grooves with more traditional rock influences and even some folk and blues. What comes out has a very contemporary sound but with much more sophistication than you would expect from such music. Their writing is lyrically interesting, the musicianship is first-rate and includes cameo appearances from two of the bright lights on the acoustic jazz scene, their vocals are very distinctive and they have a tendency to throw in musical surprises with some degree of regularity. Most of the members of the Philosopher Kings have had some jazz background, and that permeates their music: not in terms of a swing or bop rhythm, but in sophisticated harmonic structures, and in an ability to create a good instrumental solo. Another distinctly jazzy facet of the group is the acoustic bass of Jason Levine. Further, it is the pianist, rather than a guitarist in the group who does much of the writing and one can tell the songs are not based on guitar riffs like most rock. The keyboardist and main lyricist is Jon Levine, who cites Tom Waits, Otis Redding and Prince among his influences. James McCollum and Brian West are the two guitarists whose styles run from the folky to the funky, and on drums is Craig Hunter who has no qualms about scaling back to playing minimal percussion. Lead vocalist Gerald Eaton, who grew up with Jon Levine, becomes the most recognizable part of the group's sound. He sings with an interesting blend of soulfulness, bit of rap influence and dash of the ennui of a fashionable sophisticate. It's an odd combination, but it works well, mainly because what they do doesn't sound contrived. Their goal often is to be funky, but they are, after all Canadians, and they realize it. So they play a combination of what they like and what comes naturally, with the result usually being quite successful musically, avoiding either clichés or pretense. If I can be allowed to use the word "eclectic" one more time, it's a term which certainly applies to The Philosopher Kings the debut album by the Canadian sextet by the same name. They draw on everything from funk to folk in a blend that sounds as unpretentious as it is uncategorizable. The combine good writing and excellent musicianship in a sophisticated amalgam that grows on you with each listen. The main problem I have is with the album's sound. It reminds me of a sonic equivalent of the grainy black and white look that is so trendy in music videos these days. Though the proportions of the instrumentation in the mix is good, I dislike the sonic treatment which is getting to be something of a fad in some circles -- vocals with an odd, telephonic quality, either too much reverb or not enough on various instruments, and completely inexcusable amounts of compression on just about everything that ruins the band's sense of dynamics. Jason Levine often plays an acoustic bass, but in the mix it usually gets buried or compressed so much it sounds like a synthesizer. Someone should explain to engineer and mixer Lenny DeRose the difference between artistic use of audio effects in the studio and bad sound. Sonic shortcomings notwithstanding, the Philosopher Kings debut album is an impressive recording by a very creative band with little respect for musical boundaries.